Collecting stuff is pretty much an common theme when it comes to hobbies. In fact, CCG means collectable card games. I was raised on collecting baseball cards, and I’m not totally afraid to admit that I have played Pokemon once or twice (Only the old school Red/Blue on the original Gameboy). We, as humans, want to collect things. But the funny thing about collectable card games is that they are games as well. You play games. Having a stack of baseball cards does nothing, as you can look at them through the plastic pages in your binder, but there’s nothing really that you can do with them. Magic, being a game, means that you can collect and play them at the same time. You can fill your decks with treasures that you open or trade for. That’s part of Magic’s appeal, you can do both. Yesterday WotC released the newest From the Vault series where it’s all Legends. By having all 15 special foiled cards be Legends, we can use them to build our decks around. This naturally would be amazing for Commander since we love to pimp out our decks as much as possible. Personally, I’m not going to open my box. This is a huge disappointment to me. I’m not trying to short the market by having fewer copies of the product around, I just don’t see the value in opening them up. I really wanted to play with these cards too, so it’s not like I’m trying to jump on a bandwagon here. With reasons I get into in my next GatheringMagic piece, I just don’t see this as a good meshing between the concepts. Not because I only have one of those Commanders in my Highlander Collective (We’ll get to that in September), but because I feel that WotC didn’t take full advantage of the situation. The product was created to help bring back high level collecting to Magic. I’ve got some weird things in my Magic collection: unopened Mirrodin Besieged Faction packs, the old Duelist abacas counter, a print copy of The Sideboard from the Summer of 1998 and about 100 copies of Madrush Cyclops. Looks like I’ll be adding an unopened From the Vault: Legends, still in its white protective box, to that collection. I wanted to have it to complete my collection of my FtV purchases. It’s not going anywhere. Right now it has the same play value as my Baseball cards. 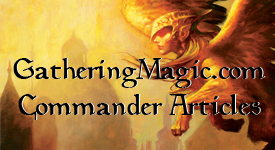 This entry was posted on Saturday, August 27th, 2011 at 1:24 am	and posted in Commander, EDH. You can follow any responses to this entry through the RSS 2.0 feed. So let me get this straight…you really want to play with these cards, and are also very disappointed you “can’t” play with them. But you “can’t” play with them because…because this isn’t a good mesh of the playable & collectable concepts? What???? Sounds like a personal problem. Instead of coming up with a “reason” that reeks of self-pity and/or martyrdom, maybe you could just…open the box and play with the cards? Even if the box is open and the cards are sleeved, they are still in your collection, are they not? Once you cease your self-inflicted, misguided “protest”, they’ll gain way more play value than your baseball cards. I’m not trying to be overly critical here, and I don’t want this to sound too harsh, so I will clarify that I normally enjoy your posts, which even when I disagree with them, are typically very thoughtful and well done. But in this one (and the “99 problems controversy” one), it just seems like you are looking for things to complain about, for things to feel sorry for yourself about. As you said before, this is a hobby, it is supposed to be fun. Where is all this angst coming from? My unsolicited advice is to open the cards and enjoy them, for they are very cool. Sounds like you would be much happier if you did. I have unopened boxes of both FtV:dragons and Exiled. At first I wanted to collect all FtV sets, but when Wizards changed the distribution to brick and mortar stores I couldn’t pick one up. So, I’m left with two valuable boxes that have little value to me, but for which I can’t find a collector that wants to trade them. SCG is selling them for $100. My main problem with it is that Wizards is giving these sets to some privileged people who can get them at retail, and consequently sell them for $100… my esteem for Wizards dropped a few notches.